The first installment of the Sweet 16 is now in the records book. 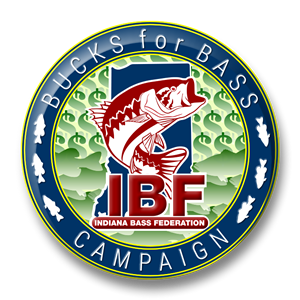 The top IBF anglers in the state met at Syracuse, IN and battled it out on Lake Wawasee and Lake Syracuse to become the first group to be known as the Sweet 16. 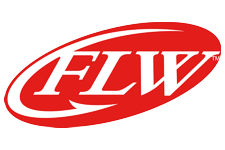 The 8 best Anglers and 8 best Co-Anglers will get their entry paid to the National Semi Finals, receive money to help cover their expense, discounts on rods from Denali Rods , discounts on Lowrance and Humminbird products, a $25 gift card from Cabela’s, and tackle from Yamamota Custom Baits, Strike King, Bite Me Tackle, Money Mouth Baits, and Rat-L-Trap. In all the anglers won almost $700 in tackle, gift cards and benefits and the co-anglers won over $500 in addition to the deep discounts on Denali Rods and the latest Humminbird and Lowrance depth finders/GPS units. Matt McCoy from Indianapolis and a member of the Cataract Hawg Stalkers claimed first place in the Anglers division with a two day total of ten fish weighing 20.52 pounds. His first day total included a 4.49 pound largemouth. He caught his fish using a “stupid” tube around docks with 15lb Seaguar line. He had Shimano reels with G-Loomis rods. Second was Bud Tonkel with 20.12 pounds. He is from Ashley, IN and is a member of Angola Hawg Hunters. Dan Guard, a member of Morgan Monroe Bass Masters is from Crawfordsville, IN He had 19.77 pounds. Brian Hensley, Edwardsburg, MI was 4th with 18.79 pounds. He is a member of the Mid Indiana Anglers. Anderson, IN native Larry Myers, long time member of the Country Bass Busters was in the lead after the first day with 12.75 pounds which was the best stringer of the weekend for the angler division. But he fell to 5th when he only brought three fish weighing 5.44 to the scales on the second day. He had an 18.44 pound total. Nick Uebelhor of Jasper, IN finished 6th in his Jasper Engines wrapped boat with 17.82 pounds. He is a member of the Patoka Valley Bass Masters. 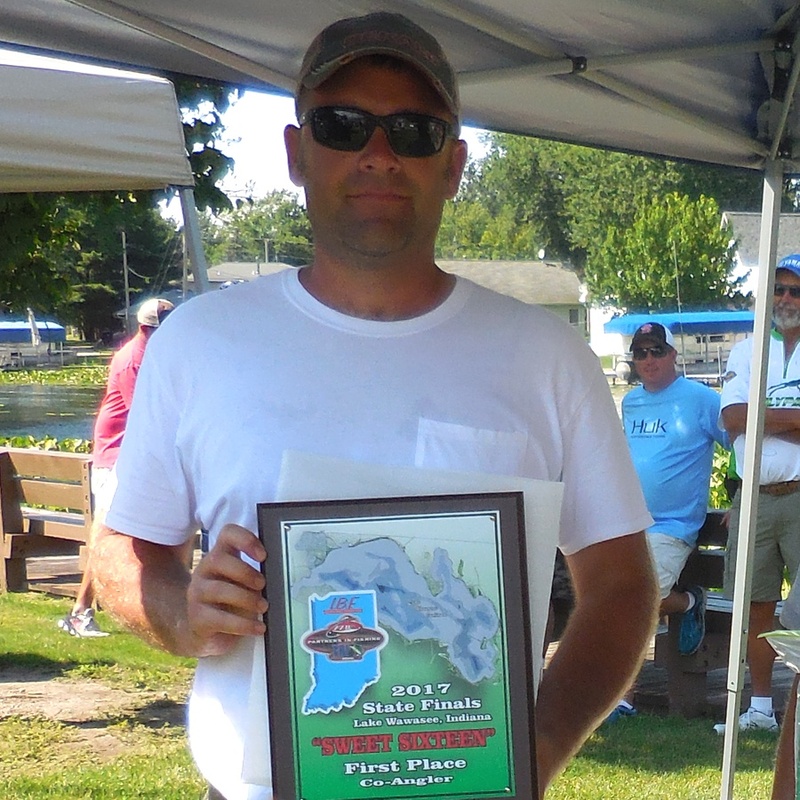 In 7th place was Jeremy Chase of Mishawaka, IN and a member the St. Joe Valley Bass Masters, the hosting club. He used his tin Bass Tracker to capture 8 bass weighing 17.79 pounds. Rounding out the 8th spot was Dave Goodman. Goodman is from Franklin, IN and although he is a member of the Hendricks County Bass Masters he earned his spot in the State Finals through the Invitational Trail. He only weighed seven bass but a big bag of 11.96 on day 2 that included a 5.62 pounder, brought his total to 17.22 pounds. 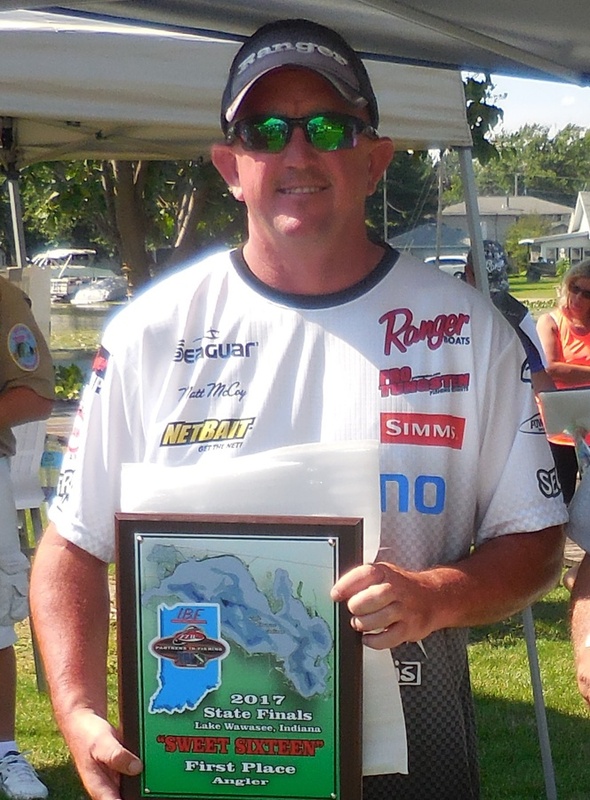 Bruce Schuyler, Greenfield, IN, captured the Co-Angler division with 23.35 pounds. That was the heaviest weight of the tournament in either division. His five fish limit of 12.85 pounds was the single day heaviest bag in either division. Like Myers, he belongs to the Country Bass Busters. He fished a “stupid” tube arounds docks and a MegaBass pop-r over weed beds. He used Lew’s reels on G-Loomis rods. David Hedge of Greenfield and a member of Indy Bass was 2nd with 18.32 pounds; third was Neil Johnson of Fort Wayne, IN and a member of Indiana Bass Masters. He had 16.26 pounds. Joshua Brown, a member of Hoosier Hills Bass Masters hailing from Lanesville, IN was 4th with 15.67 pounds. Chad Ellis beat out his brother Larry to claim the 5th spot with 15.61 pounds. He is from Brownsburg, IN and a member of the Speedway 500 Bass Masters. Jared Robinson was 6th with 16.08 pounds. 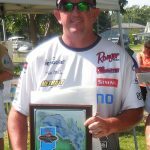 He is from Vallonia, IN and a member of the Fort Vallonia Bass Masters. Like Goodman he earned a spot in the State Finals through the Invitational Trail. In 7th was John Monaghan of Mooresville, IN. The Hendricks County Bass Masters member had 14.92 pounds. Claiming the last spot in the Co-Anglers Division was Renee Hensley. She is from Edwardsburg, MI and a member of the Mid Indiana Anglers. She brought seven fish to the scales weighing 14.70 Pounds. The Anglers brought 341 fish to the scales weighing 671.82 pounds. The Co-Anglers caught 231 fish weighing 489.09 pounds. In all 572 fish were weighed in totaling 1160.91 pounds. The fish were returned to the lake alive, away from the ramp area using release boats. Big Bass on day 1 for the Anglers division was 5.22 pounds caught by Eric Estep, a member of the (aptly named) Wawasee Hawg Hunters from Ligonier, IN. Dave Goodman caught the day 2 Big Bass that weighed 5.26 pounds. In the Co-Angler division Nick Smith from Indianapolis caught the Big Bass on Day 2; it weighed 4.24 pounds. He is a member of the P O Pluggers. Jedidiah Foster (Ft Wayne, IN) of the Summit City Bass Masters claimed Big Bass on Day 1 and for the tournament with a 6.07 pounder. And who says tournament fishing is not a family activity. Brothers Mickey and Ralph Ross of the Peru Bass Masters both fished. We had 2 father/sons; Jeff Ellis of the Speedway 500 Bass Masters fished as well as his two sons Chad and Larry. Roger Dunaway and son Hunter of the Hoosier Hills Bass Masters both fished. Brian Fenwick and son Seth Thompson of the Aqua Bass Masters both made the State Finals. There was also a grandfather/grandson participating. James Burton of the Chelsea Bass Masters and grandson Skylar Bell both fished. For the first ever we have a husband wife combination in the highest level of the Indiana Bass Federation with both Brian Hensley and wife Renee making the Sweet 16. 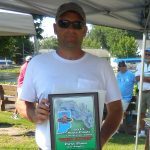 Tournament Director Darin Bongiovanni would like to thank: Diana Bauer and Jim Furlong of the St Joe Valley Bass Masters; fellow Potato Creek Bass Club members Christine Howe, Don Howe, Chuck Largent, and Alex Gurbatow; Don Pierce of the Wawasee Hawg Hunters, as well as the tournament participants that pitched in and helped. Their efforts made the 2017 State Finals a success.